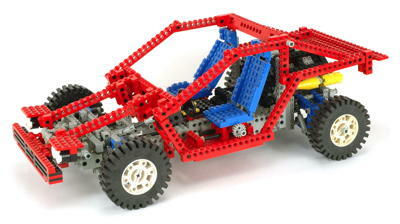 1988 featured four new Technic sets incorporating a host of new features and parts. The buggy has new rack and pinion steering and rear suspension. The excavator features rear steering and a lifting and dumping scoop. The first airplane, a very large model, features a 1 cylinder engine, movable ailerons and elevators, and a figure. Last, and by no means least, the 3rd generation auto chassis is the first with a body. It also has retractable headlights, movable seats, a V-4 engine, a differential, a 3 speed transmission, front rack and pinion steering, and 4 wheel independent double wishbone suspension. 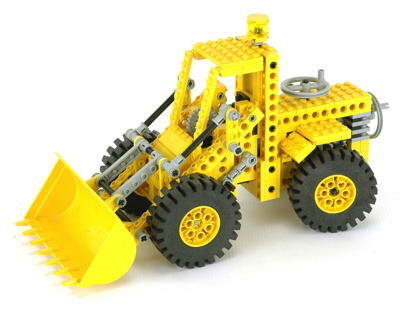 There was also a supplemental set released this year which included 3 Technic figures. Given that figures were only previously available via Arctic Action and would only come in a handful of other sets until 1995, this was a good opportunity to add some to your models. 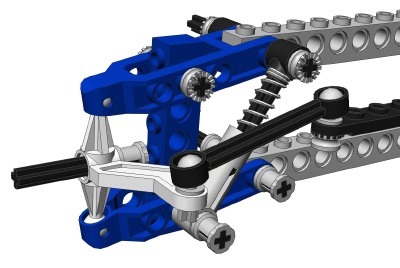 Many of the new parts introduced this year would become standard on the Technic sets for years to come, especially the new steering system, though it was used in only one set this year. The 3 blade propellor on the airplane was used on only this one model, ever. The airplane and the auto chassis represent the last sets to use the rectangular pistons which would be replaced in 1990. To compliment the existing rack and pinion steering system and steering arms, a new steering system was introduced. The steering arms and lower support remain the same, but the upper support now has an integrated rack support, as shown at right. Another special hollow part snaps into this support and can rotate around the lateral axis. This part ratchets inside the lower support to stop at discreet angles. This part is specially designed to fit an 8 tooth gear to use as a pinion. Finally, a flexible rack gear connects the steering arms. It is flexible so that it does not need to translate forward and back as the control arms rotate, instead it just flexes. Because the rack gear itself is round, the pinion gear can rotate around it and allow the steering column to be at any angle. 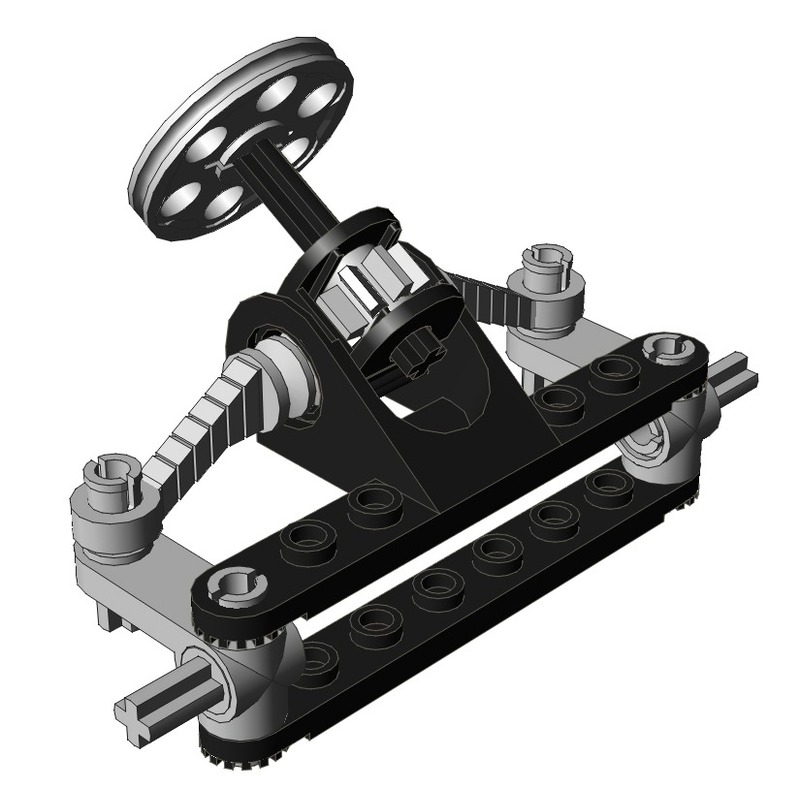 An example of a steering system using these new parts is shown in the lower picture. 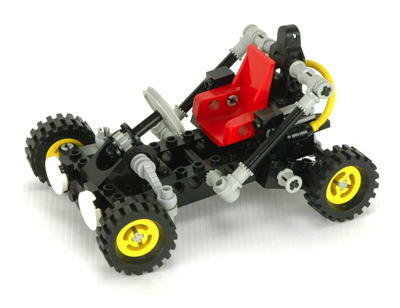 This steering setup would be used on a vast number of models for many years to come, especially the small sets (under 150 parts), but only one set in 1988. Another steering system was introduced, this time in combination with a double wishbone suspension system. The first important part is the control arm (shown in blue). These are typically used in pairs with an upper and a lower part forming double wishbone suspension. The end of the control arm has a ball joint socket. To fit in this socket is a new steering arm (shown in white). It has a ball joint at the upper and lower end, and a cruciform slot to connect to a steering tie rod. As can be seen, the steering connection is offset from the ball joints which allows Ackerman type steering. A new ball joint pin (shown in gray) fits into the slot in the steering arm. Finally, tie rods (shown in black) have a ball socket at either end and fit between the steering rack and the steering arm. This steering system is typically used with shock absorbers on the lower control arms to make a double wishbone suspension. This is only done on the largest models. A set of new tapered beams were introduced which are typically used as aircraft ribs, but have many other uses. The smaller parts tapers on both the upper and lower surface over a distance of two studs. The longer part tapers only on the top over a distance of 4 studs. A new steering wheel was introduced which is typically only used in the large auto chassis sets. 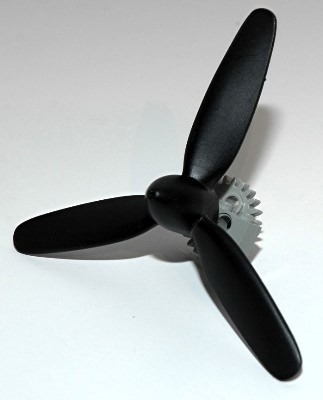 A specialized aircraft propeller was introduced. It has 3 pitched blades and a built-in 1x4 beam. Behind the beam is a 24 tooth gear which has the same teeth as a spur gear but has no central axle hole. Instead it has an offset axle hole meant to drive a piston. The gear cannot be removed from the propeller. 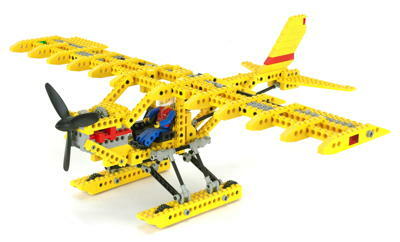 This part was only ever used in one set, 8855, perhaps because the old square piston system was replaced before another airplane was released.